Yet another Wilson/Marcos page, but what can I say- they were the go-to guys for MTIO. 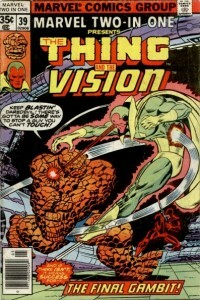 MTIO 39 is part of a three-issue story I remember fondly, probably one of the best all-time usages of the Thinker. 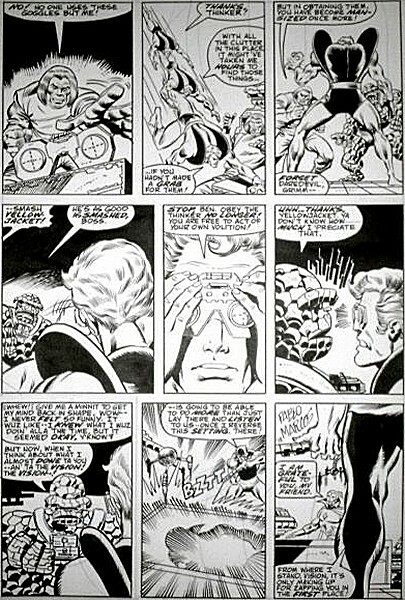 Ever since I got to write the Thinker for the Marvel Encyclopedia: Fantastic Four (one of the entries I'm happiest with), I've been wanting a Thinker page, and we get the Hypno-Goggles here as a bonus! This page also includes Yellowjacket (half-in-costume), Daredevil (in half of YJ's costume, in the next to last panel), and the Vision, in the last panel, so all-told I have three superheros and a supervillain here. How can you go wrong? I picked this up in January, 2005, off of EBay. Oddly enough, I bought it from someone I'd bought from on EBay before- the same person who sold me my MTIO 46 page about two and a half years earlier. He did have the artist wrong- he listed Jim Graig (Craig), instead of Ron Wilson, but, hey, I knew it going in, so c'est la vie..